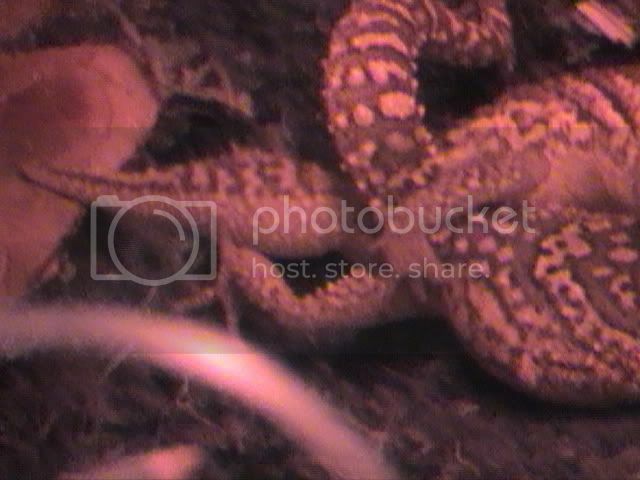 Kingsnake.com - Herpforum - RE: Ocelot gecko anyone breed them? RE: Ocelot gecko anyone breed them? By 'ocelot' geckos, I presume you mean Paroedura picta. I have myself kept and bred them, having a relatively large breeding pool at present. 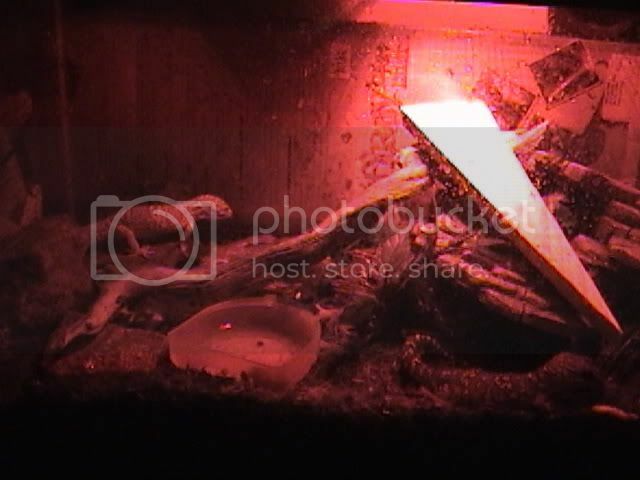 I offer these animals a combination of a humid hide/nesting box of vermiculite misted every other day AND a very shallow water recepticle (be it a niche in the rocks of their cage or a plastic lid). Ive seen some of them drink from the shallow water dish- Ive also seen them walk through the dish and lick the water from their feet. Ive seen that the adults, especially the males, tend to enjoy spending time in the humid hide. Misting is the best method however, as it keeps the humidity up AND allows water to collect on the side of the enclosure; which the geckos often lap up. Misting CAN have some negatives though (see below). Males and females can be kept together before and after mating without much difficulty; though extremely 'aggressive' males may eventually damage a female (havent had that happen myself; but Ive seen them be quite rough with females). Mating usually occurs in hiding and at night or early morning. The male with 'mount' the female, often grasping her by the neck in his mouth (this dosnt appear to hurt the females). Their tails entwine and mating occurs. Sometime after this occurs, you may notice your female 'digging'- this will likely be the only time you witness one of these geckos digging. She will dig a small hole and deposit here eggs (see below). After mating has occured, the males and females seem to live in absolute harmoney- Ive often witnessed them sitting together, or apart. Some seem more attached to their mates than others; while some seem to prefer their space. For the most part, these animals are very mild mannered and can be housed together easily. The exception to this is males; which are quite territorial when it comes to other mature males (immature males are neither aggressive, nor seen as a threat by most adult males- this dosnt mean they should be kept together however). 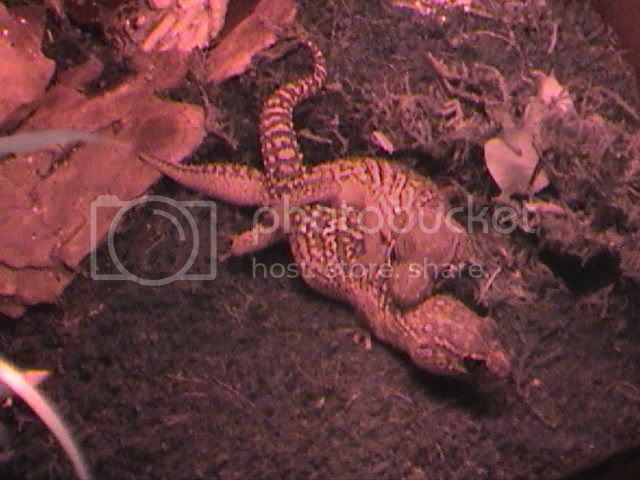 I even kept a leopard gecko and picta together in a single cage at one point, as well as had them as part of a large community tank of varoius species. When the male I used in this instance matured however, he became aggressive to other male lizards (even of other species). Pictured: Leopard gecko and Picta gecko living together. 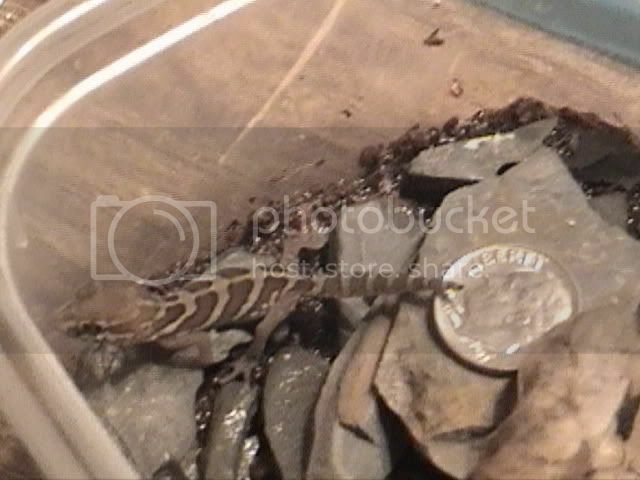 ... and a still frame of the male picta attacking the Leo (feeding seemed to cause the aggressive response). 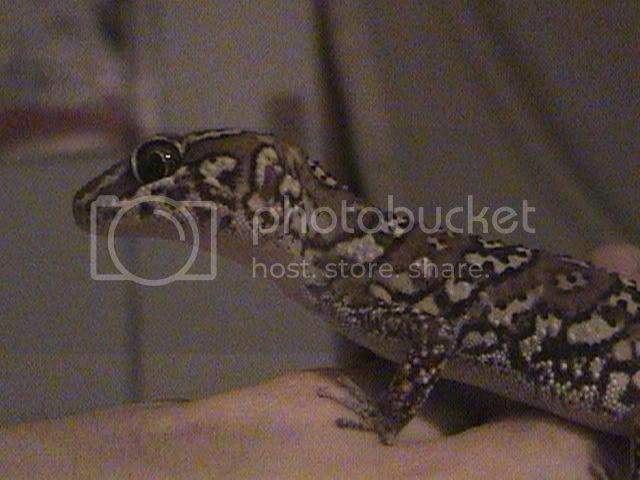 NOTE: I do NOT approve of keeping various species together; but it was early in my reptile keeping career. Whatever the case, females MUST be seperated from males every few months; preferably for a few months at a time. This gives the females time to regain their strength. 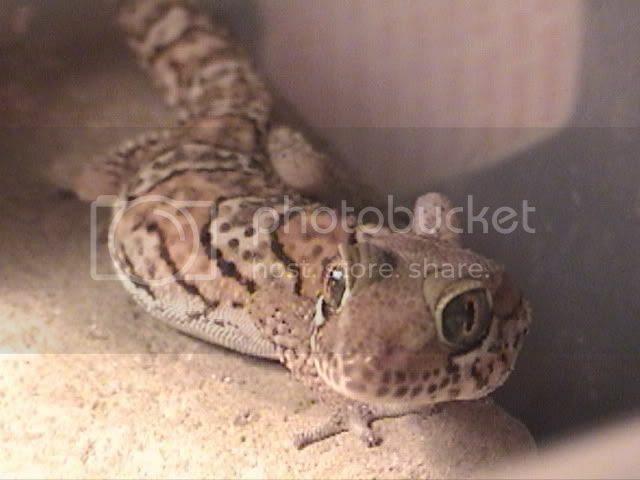 Understand that these geckos will breed throughout the year, and over-breeding can eventually kill a female. PREFERABLY, you want the female to lay her eggs in the humid hide/nesting box; where they can be easily seen and removed. Ive had the eggs laid in the nestbox about 1 in 10 with eggs, the females seeming to prefer to dig down into the substrate of the cages (requiring removal if you wish to try incubating them yourself). BE EXTREMELY GENTLE WITH EGGS! They are extremely fragile, and its easy to damage them accidently by dropping them, digging for them, or similar activitys. NOTE: Something you can do to minimize the chances of having eggs laid in the substrate, is to stop misting the cage; or do so in a manner that does not heavily saturate the soil- the females typically will not lay their eggs in dry substrate, so only moistening the upper layers tends to reduce this. The eggs Ive hatched were kept around 84-85 degrees; typically around a month to six weeks til hatching. However, my overall approach is to not throw them out until they start smelling or get mold growing on them. I incubate them in vermiculite. After about 20 days, I check the incubator once daily for hatched babies. 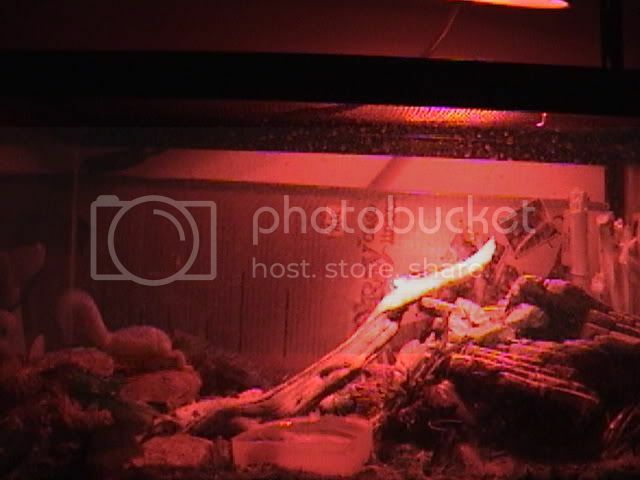 Be sure if using a home-made incubator, that the young geckos cannot somehow endanger themselves (such as exposed water which can pose a drowning risk). 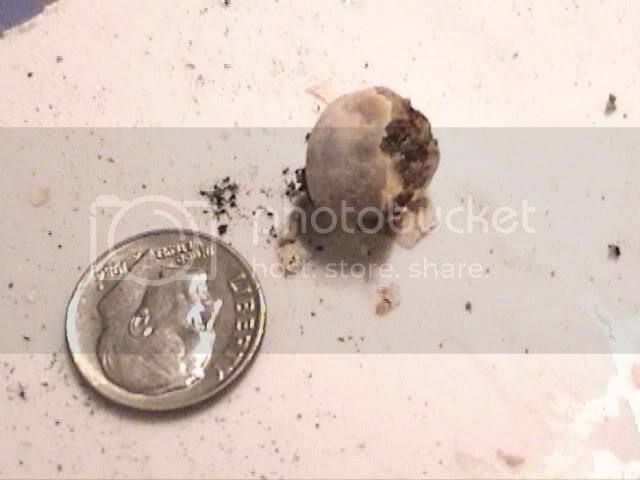 Hatchlings usually dont eat until after their first shed (2-3 days); but there are exceptions. They are EXTREMELY small, so make sure you have easy access to fruit flies or pin-head crickets (much larger and they refuse to feed).